Miami Beach 411 > Hotels > 3-star > Townhouse Hotel in Miami Beach, FL. ¿Hablas Español? ABOVE: A cel phone video clip of the terrace at the Townhouse Hotel. Watch more hotel videos. This page allows you to find directions, post a comment, read reviews, and check rates at the Townhouse Hotel. Rates: Low season from $99. High season from $179. This trendy 71 room hotel sits only a half-block from the beach at the northern end of the Art Deco District. The Townhouse offers minimalist, white, public spaces, and a fun atmosphere at a moderate room rate. The interior of the hotel is strikingly modern. 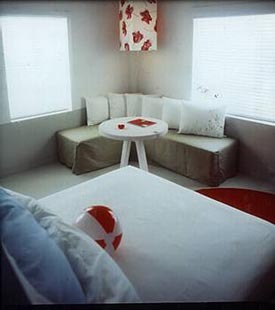 Guests climb a short flight of stairs to an all-white lobby with low couches, ceiling fans, a single scarlet chair, and bicycles leaning against the wall. The Townhouse is famous for its rooftop sundeck, featuring a bar open Wednesday through Saturday nights - turning the roof into a nightspot. 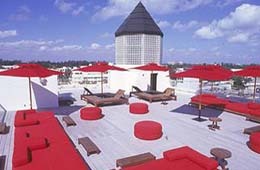 The terrace also has teak patio furniture and queen-size waterbeds for lounging on during the day or night. Wireless Internet access (Wi-Fi connections) is available throughout the hotel and guest rooms for a charge of $10 per day. Click HERE for Townhouse Lodging Information. • The Townhouse is on the Right (East) side of the street. The Townhouse is located at 150 20th St., Miami Beach, FL 33139. Use our Miami hotel map to find the exact location. Townhouse Hotel in Miami Beach. Miami hotel reservations.